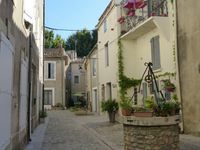 Properties in Lagrasse average 4.6 out of 5 stars. Property 2: Holidays in Lagrasse - Terrace Apartment with private terrace & garden views. Property 4: ADORABLE COTTAGE ZEN LAGRASSE near Carcassonne. Ideal for a relaxing stay. Property 7: Medieval village - house with all mod cons! Property 11: Holidays in Lagrasse. Stunning Studio, private terrace near Carcassone. MAISON BACCHUS - Brand New Renovation Medieval House! Property 16: MAISON BACCHUS - Brand New Renovation Medieval House! Property 27: Air-conditioned villa located in a land with trees and private pool. Property 29: Small village typical of the Corbières between Narbonne and Carcassonne. Property 44: Gite Le Vieux Pressoir, Montlaur. Near Carcassonne. In the heart of the Corbières.